I had the pleasure of assisting a friend in buying her first motorcycle. 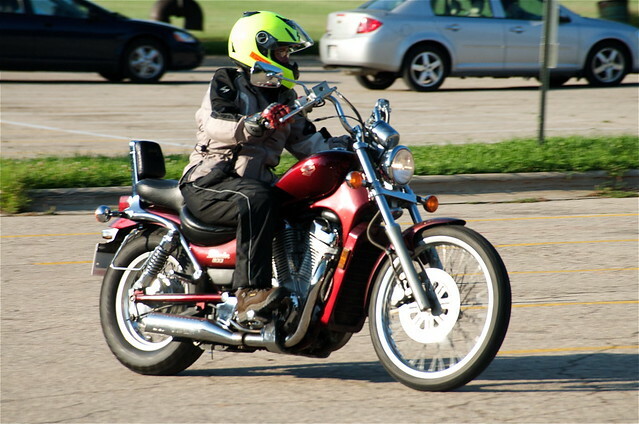 Having taken the Motorcycle Safety Foundation rider training class through Madison Area Technical College and subsequently passing the DOT written exam, she was licensed and ready to shop. She had already spent a lot of time thinking about riding and how she wanted to ride, and settled on a cruiser as her first bike. A couple of months of used bike searching let her know what was out there, and we agreed to meet at Motorcycle Performance to kick some tires. In a boldly decisive stroke, she bought a bike that very day. Now that is my kind of impulsive! 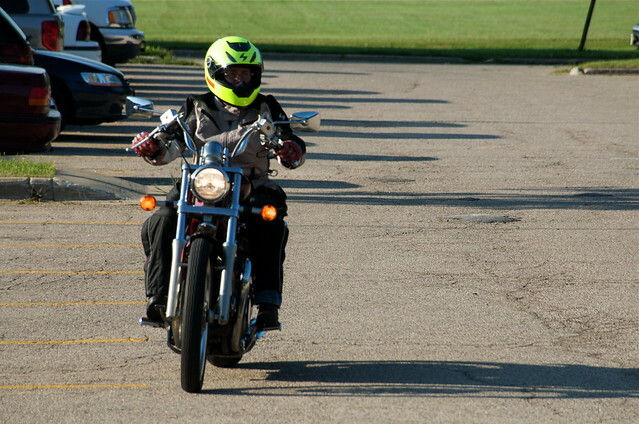 Since her riding skills were minimal, and already a couple of months rusty, I agreed to ride her bike to a large parking lot where she could refresh her training. It was hot - 90 degrees (F) or so - but she still had her protective gear on (ATGATT!). We started with the real basics, including me stunning her with this question: You are riding and the bike seems to be running out of gas. What do you do? She knew the words of the answer, switch to reserve, but she had not yet attempted the physical action needed to do so. After a brief moment of WTF, she reached down and fiddled with the petcock until she had some familiarity with the motion. Basics indeed! After an hour or so of parking lot drills: left and right hand turns, accelerate-shift-decelerate-and-stop, figure eight's and such it seemed she had her memory refreshed and had confidence. The only thing that threw her for a loop was the "pretend you are on a steep uphill at a stop sign...how do you get underway again" drill. After a few laughing stalls, she got it and will likely never have trouble with that again. This effort on my part is completely self-serving you understand. With some up front effort on my part, I get a new riding buddy. Welcome to the club, Aitch! Let's go riding this fall. you got it N'Otter....Looking forward!!!! THANKS darlin'!